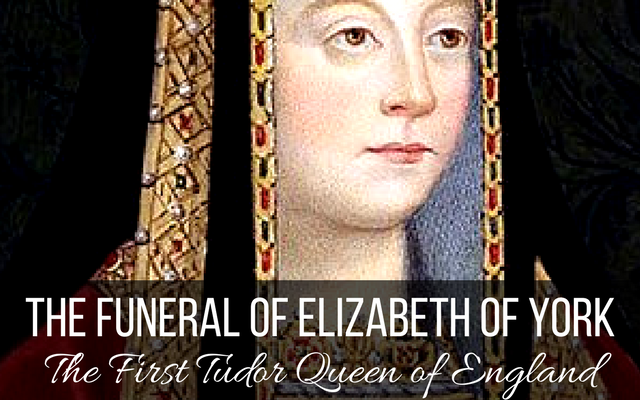 Elizabeth of York, Queen to King Henry VII of England, died in the Tower of London on February 11, 1503. She had given birth to a daughter Katherine on February 2 and never recovered. The death was a shock to her husband, her children and to the nation. Due to detailed accounts, most likely composed by a herald, we have a narration of the funeral as well as financial account records. The king ordered two council members to arrange the funeral; his treasurer, the Earl of Surrey and the comptroller of his household, Sir Richard Guildford. The citizens of London had substantial input as well. Upon her death, the bells of St. Paul’s Cathedral rang out and soon all the other churches rang their bells. Elizabeth’s body was washed and dressed in her estate robes and laid out on her bed. Her children were brought in to say their goodbyes and pay their respects. The same day, her body was embalmed by the sergeant of the Chandlery. He was given many ells of cerecloth, gums, balms, spices, sweet wine and many pounds of wax. Her body was washed with wine and rosewater and rubbed with balm and perfumed spices. Next, the body was wrapped in the cerecloth with had been broken down into strips and dipped in molten wax. The King’s plumber then enclosed the body in lead and marked it with a lead epitaph with her name and who she was. The lead case was enclosed in a coffin made of holly wood and the coffin was covered in black velvet with a cross of white damask. The coffin was carried by persons of the highest rank with a canopy held over it by four knights as it was taken to the Chapel of St. Peter ad Vincula within the confines of the Tower on February 12th. Following the casket was Lady Elizabeth Stafford, first lady of the bedchamber, the ladies and maids of honor then all the rest of the Queen’s household, marching side by side. The chapel was lit by five hundred tall candles with the windows being lined with black crepe and the walls hung with black damask. The coffin was positioned on a bier in front of the altar. Elizabeth’s sister Katherine, Countess of Devon arrived and took her place at the head of Elizabeth’s body where she stayed while mass was celebrated and offerings made. She then retired. The coffin remained in state while six ladies kept vigil at all times. Katherine attended most of this vigil as the Queen’s chief mourner. Masses were said for three consecutive days. At night, the Lord’s Prayer was recited for the Queen’s soul. The coffin remained in the chapel until the day of the funeral procession which was February 22nd. On that day, mass was said at St. Peter ad Vincula. At noon the coffin was put on a carriage which was lined with cushions made of black velvet and blue cloth of gold. 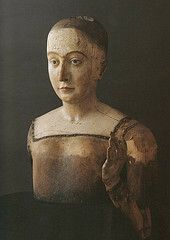 Placed on top of the coffin was a lifelike effigy clothed in the robes of the estate of a queen with a crown on her head. Her hair flowed down to her shoulders and she held a scepter in her right hand. Her fingers had gold and precious stones on them. The procession for the funeral took the same route to Westminster Abbey that was taken for her coronation because Elizabeth died in the Tower which is where queens stayed the night before their crowning. Many commoners lined the streets to witness the cortege. The procession was led by two hundred poor folk carrying torches who had been dressed in black cloth from the great wardrobe of the king himself. Behind them came numerous household members, clerics, the Mayor of London and then the Queen’s coffin. The carriage was drawn by six horses trapped in black velvet. Beside the coffin rode many knights who carried banners representing royal arms, royal saints (Edward and Edmund), the Virgin Mary, other saints and the parents of the queen. Hundreds of escutcheons had been made with the arms of the king and queen and these probably hung around the coffin and were among the procession as it made its way through torchlit streets. Behind the carriage of the queen were eight palfreys saddled with black velvet bearing ladies of honor riding in single file. Each horse was led by a man in a black gown. 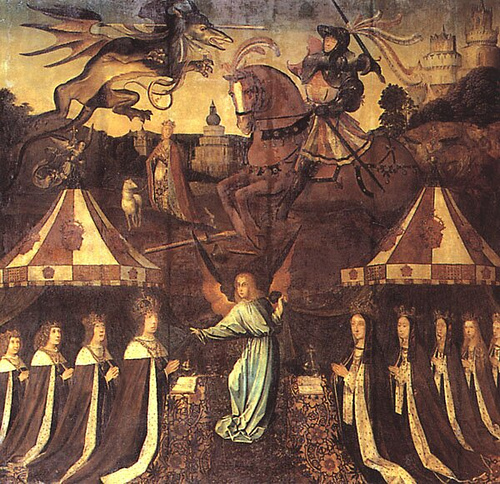 Among these ladies were the four sisters of the queen. There were other noblewomen in carriages followed by representatives of the city of London and the royal households. Many guilds provided mourning clothes for their members. Some of their representatives dressed in white and stood holding torches before the monument to Elizabeth’s predecessor Eleanor of Castile (first wife of King Edward I) at Charing Cross as the procession passed by. The lady mayoress of London arranged for thirty-seven virgins, one for each year of Elizabeth’s life, to hold burning tapers and stand in Cheapside in the queen’s honor. These women wore white linen and had wreaths on their heads in the colors of the royal Tudor livery. Parish churches along the route contributed torches and their choirs stood outside, singing anthems. All the City churches were draped in black. As the cortege passed each church, a curate would come forward and cense the coffin and the bells would peal. There was a delegation of foreign funeral-goers which included French, Spanish, Venetian and Portuguese and others who carried torches decorated with their country’s arms. Their presence signified European acceptance of the Tudor dynasty. Along the route there were five thousand torches carried by citizens wearing white woolen gowns and hoods. The procession made its way to St. Margaret’s churchyard at Westminster where it was met by eight bishops. The coffin and effigy were placed on a hearse which was hung with black cloth of gold and ornamented with her motto “humble and reverent” in gold. Four white banners were draped over the corners of the coffin, supposedly to signify she died in childbirth. There were other emblems of Tudor queenship displayed such as gold roses, portcullises, fleur-de-lys and her coat of arms entwined with the king’s beneath crowns. The coffin on the hearse spent the night in the Abbey surrounded by torchbearers and other observers, mostly ladies and gentlewomen. As the coffin lay in state in the Abbey the night before the burial, Elizabeth’s sister Katherine, along with her nephew the marquis of Dorset and the Earl of Derby presided over a supper of fish in the queen’s chamber at Westminster. During the supper, in the Abbey, knights, ladies, squires and heralds kept vigil over the body all night while over one thousand candles burned. On the final day of the funeral, candles flamed around the coffin and two hundred and seventy-three tapers decorated with escutcheons burned above black cloths hanging from the roof. There were two masses and then the Bishop of Lincoln officiated the final requiem mass. Women were the first to give their offerings and they were led by Katherine as the chief mourner. After the offerings, the women presented palls of blue and green cloth of gold which were laid over the effigy. The Bishop of Rochester gave a sermon. After the sermon, the palls were removed and the ladies exited after symbolically burying the Queen with their palls. The prelates and the king’s chapel were left to perform the actual interment. The effigy was removed from the coffin. The Bishop of London sanctified the grave before the coffin was lowered. Elizabeth’s chamberlain and gentlemen ushers tearfully broke their staffs of office and threw them in the grave. Because construction of the Tudor tomb in the Lady Chapel had only just begun, Elizabeth was buried in a vault specifically made for her in the crossing of the Abbey, between the high altar and the choir. She would be re-interred in the magnificent new tomb after the death of King Henry in 1509. Henry had been generous in his expenditure for Elizabeth’s funeral. In April of 1502, when his eldest son Arthur died, Henry paid £600 to bury him. For Elizabeth’s ceremony, he had spent £3000. In today’s equivalent, that amounts to £1,381,000. Clearly this funeral had more significance to the Tudor dynasty than Arthur’s. The design and execution of the procession was meant to be dramatic, spectacular and memorable for the royal household, the nobility, and the citizens of London and for all who witnessed it. The entire ceremony was an opportunity to have a huge public display to denote the wealth, prestige and substance of the Tudor dynasty and to allow the public to participate and grieve for their queen. The numbers of citizens who appeared to witness her coffin pass by were a tribute to Elizabeth’s role and status as queen as well denoting their love for her. Wow! Moving retelling of this sad event. This article was very informative and interesting. I have always liked Elizabeth of York. Childbirth was a dangerous state back then. This article was very informative and interesting. I have always liked Elizabeth of York. Childbirth was a dangerous state back then.I enjoyed reading “The White Princess” by Philippa Gregory.